Life is a collection of precious moments that weave themselves into your life's story, and we are here to help you preserve, treasure, and celebrate those memories. Lindastars is the place you seek when you need more than just a piece of jewelry, because we know that your moments, your story, and the story of your loved ones must be told, shown, and treasured in the most special ways. 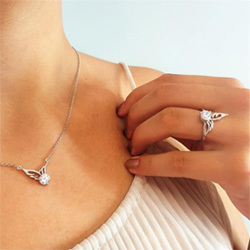 Our angel wing jewelry conveys hope, protection, inspiration and love, making our jewelry unique, eye-catching, and meaningful. There is no better way to celebrate your milestones and preserve your memories than through our original designs. You are the inspiration for our story, let Lindastars be a part of yours. Love the necklace I will order more later. Every one comments on how pretty it is. I'm very pleased with these. They are beautiful. Well made and I receive compliments every time I wear them. Would recommend them to my friends and family. I ordered 2 Bracelets for my Stepdaughters and they were perfect! Just what I had ordered! Will definitely order again! Thank you! I love my bracelet! When I wear it I feel as if my husband is with me and that makes me very happy. Thank you so much for making such lovely products. My sister-in-laws were very pleased with them. Cee cried at first and then put it on and I have seen her twice and she still had hers on. I love everything about them . Beautiful! Thank you. My mom loved the sentiments on the necklace. I purchased for myself and my daughters. They were completely surprised and delighted. I am so pleased with the purchase. I love them. Give two as gift. Thank you. This was a gift for a family member who lost a loved one. They both loved it. Your story is our inspiration. And your story makes our jewelry more than just an adornment. Lindastars jewelry is a statement that expresses your story, your hopes and dreams. Our designs reflect the beauty of life, the joy that love brings, and the inspiration you seek, as well as the strength of your unbreakable connection to the guiding forces on the other side. Our intent for every piece of our jewelry is that it brings to your mind a special memory or inspire a hopeful and joyful feeling when you wear it. As our hallmark symbol, the angel wing is a guiding element in our designs, a delicate and beautiful reminder of the fragility and hopefulness of life. The angel wing is a universal symbol that transcends culture, religion, and language and tells a story of hope, inspiration, protection and connection. Not only is it a sign of the angels in your life, our angel wing symbolizes the preciousness of life itself, of which we must sometimes be reminded. Even when you are faced with struggle or grief, challenges or obstacles, there is always a helping hand, a guiding light, and your special Lindastars piece that will be your grounding keepsake—a comforting reminder that you are loved, protected, and supported. When you choose a piece of Lindastars jewelry you choose originally designed and deeply meaningful jewelry that will inspire, bring hope, connection, love and be a stunning reminder of the beauty of life, always.